Trollwar is a new Canadian folk metal band from Alma, Québec. The band was formed in March 2011 and few months later they released their first EP “Bloodshed Forges“. Thanks to the good feedback they got for this EP, the band appeared at many local gigs, surprising the underground Québecoise scene, especially with the use of accordion. After several line-up changes they started working on their debut full-length album “Earthdawn Groves” that was finally self-released on the 1st of December 2013. The 7-piece band plays a mixture of epic black metal, melodic death metal and folk metal, influenced by the big names of the genre. “Earthdawn Groves” is a long album, including 10 songs plus a bonus acoustic instrumental version of the album-titled track, while its total duration is 62 minutes. Trollwar use a lot of synths in their music and together with the accordion they add a very melodic folk “layer” to their orchestrations. Of course their guitars are of equal importance in their compositions, with good riffs, nice technical solos and melodic leads. In my opinion the production of their guitars is much better than that of synths and accordion, which sound less natural. Their vocals most of the time are black metal screams, but they also have epic backing choirs and few clean male vocals, following the atmosphere of the music. There are differences between each song and sometimes inside each song. There are parts where they sound more serious and epic, others where their folk nature becomes dominant and parts where they have a more happy or humorous approach. I find all of their compositions very interesting and my favorite track is the folk metal “hit” “Trollka“, for which the band also released a video-clip. 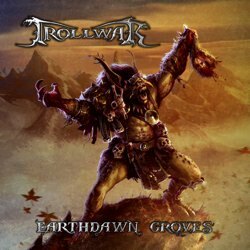 Trollwar is a very melodic band and its members seem to have many ideas and good composing skills. Folk metal fans should keep an eye on them, since their music is really enjoyable. Their production still needs a lot of work though, especially synths and folk instruments, as well as the clean vocals. “Earthdawn Groves” is released in a standard jewel-case edition CD including a 4-page booklet without the lyrics. Cover artwork by is Nicolas Francoeur (Vorace Art). You can visit their official pages to listen to their music, or watch the official album trailer below.